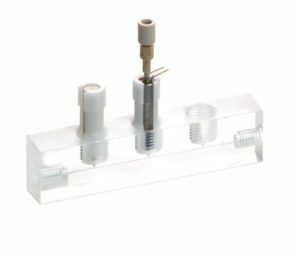 Medical manifolds are a way of bringing together multiple samples, chemistry, reagents, washer and buffer solutions into a simple, reliable unit. These manifolds can incorporate many different sub-systems with various fluids, pressures and flow rates, into one assembly. 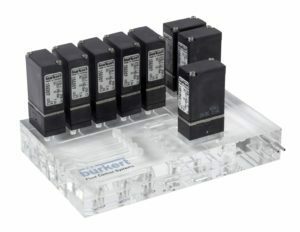 They can also include pneumatic control systems to connect to valves, pumps, volume reservoirs and a range of control components. Analogous to printed circuit boards, it is fundamentally about driving the system complexity into a single, highly repeatable component. Applications for medical manifolds include clinical diagnostics, point of care devices, patient monitoring, critical care theatre systems, laboratory equipment, dialysis machines and many other medical devices. 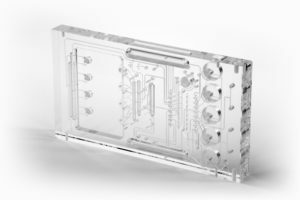 Diffusion bonding methods provide by far the most design flexibility and capability when manufacturing medical manifolds. Carville’s high accuracy diffusion bonding techniques give the ability to produce multi-layer, three dimensional channelled plastic manifolds, with a very tight tolerances and repeatable quality. The plastic materials, typically Acrylic (PMMA) or Ultem (PEI) are primarily bonded using heat and pressure to create a molecular bond and avoiding the use of potential contaminants such as adhesives, cements or solvents. Medical manifolds at Carville are produced from fully heat treated materials, which are then diamond milled to ensure they are flat and parallel prior to the machining of the tracks and bonding. Post bonding features are then machined and additional components added as required. As medical manifolds are machined and bonded (compared to cross-drilled), they offer the design engineer the ability to introduce smooth flow paths and complex internal features which cannot be achieved using conventional machining or moulding techniques. Internal tracks can be machined to various widths to create restrictions, reservoirs, mixing chambers and many other features for controlling fluids. Most medical manifolds have valves mounted to them and Carville have produced a range of manifolds from simple versions with a few valves up to complex, large solutions with 300 valves. Manifold mounted valves offer advantages such as easier assembly and servicing, reduced dead volumes and increased design flexibility. Many other components can be integrated onto or inside the manifold such as pumps, heater modules, electrical circuits and filters. Carville use a wide range of standard and bespoke fittings on the manifolds, including threaded connectors, press-fit stainless steel tubes and mounting inserts. 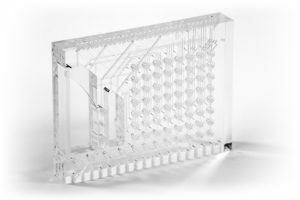 Due to the good optical properties of Acrylic/Plexiglas (PMMA) many applications involve specific areas for optical sample inspection, often by mounting various sensors such as Near Infra-red (NIR) or fluorescence sensors. Carville developed a method to bond Acrylic materials for aerospace applications in the 1960’s. This technique was further developed and in 1980 we produced the world’s first diffusion bonded medical manifold, used in a blood diagnostic system. Continuous development resulted in Carville’s unique High Accuracy Diffusion Bonding (HADB) technology, first used in 2009 which allows very complex manifolds, including microfluidic channels, to be manufactured to tight tolerances in a highly repeatable way. These are now being used extensively for medical, life science and laboratory equipment systems around the world. What are the benefits of using medical manifolds?